This post is a follow up to “The Good, the Bad and the Ugly – State Revenue Collections”. To recap: Recent census bureau data shows that aggregated state revenue collections for the United States have been increasing in recent years, and in 2012 returned to their 2008 levels. Unfortunately when we account for population growth and inflation, state revenue collections are at less than 92% of their prerecession highs. Policy makers and those working with states can make better decisions if they understand the state of revenue collections. Looking at the national picture is a good start, but it doesn’t capture the reality on the ground. It turns out that the national picture masks large variability in revenue collections. There are a number of states with strong revenue growth, but there are even more states that continue to suffer lagging revenue collections. A look at the state-by-state revenue collections shows a mix of haves and have-nots. The map below shows the changes in state revenue collections from 2007-2012 for each state. (I’ve used 2007 as the baseline, because the 2008 state-by-state revenue numbers had unusually high variability. I think this was related to how quickly each state’s collections were impacted at the onset of the recession.) These numbers reflect tax revenue collections and aren’t adjusted for population growth or for inflation. It is readily apparent that the recovery in state tax collections is quite varied. More than a dozen states had yet to make any gains relative to even their unadjusted 2007 revenue levels. Almost all of these states are in the west and in the southeast. There are several states (in darker blue) that have had very large increases in state revenue collections over the same period. North Dakota and Alaska led the pack with revenue growth of 215% and 91% respectively. Both of these states get a significant share of their revenue from energy production. By way of illustration, Alaska and North Dakota respectively got 82% and 57% of their state revenues from severance taxes on the removal of natural products. In fact, energy rich states have led the nation in growth of state revenue collections - i.e. Texas (21%), Wyoming(26%), North Dakota(91%) and Alaska(215%). Other states have seen their revenue collections improve due to fiscal policy. Illinois tax collections grew by 21% over the 2007-2012 period, but this was due in no small part to a 2011 67% increase in its personal income tax rate and a 46% increase in its corporate tax rate. 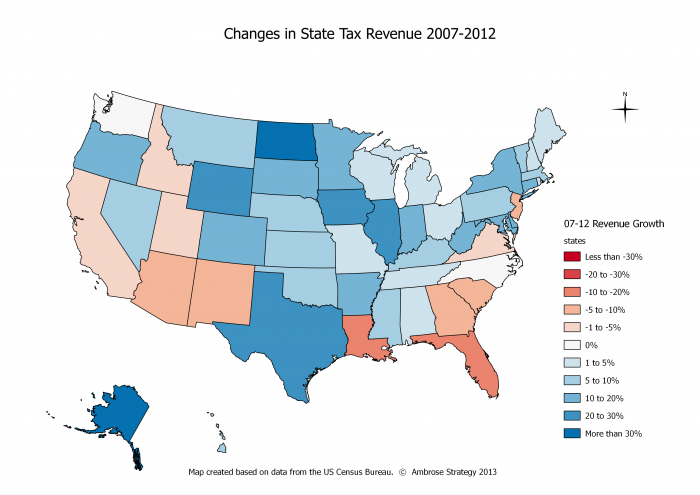 A number of other states in blue, like New York and Oregon, significantly increased tax rates over the same period. States have certainly welcomed the recent recovery in state revenue collections. Unfortunately most states still have a long way to go before they get out of the hole that the recession has put them in. Take for example my home state of North Carolina which is facing regional headwinds. North Carolina could try to improve its revenue picture by pursuing natural gas production. There is modest evidence in the Census data to suggest the tax collections from large natural gas producers (PA, CO, AK) are faring better than average, but the numbers don’t suggest that natural gas production will be a game changer for North Carolina and other states with more modest reserves. North Carolina could also try to monetize its much larger offshore reserves. This depends on the Federal Government giving the state a portion of offshore revenues and that seems very unlikely. That leaves North Carolina (and many other states) with the difficult and fundamental choice of either increasing tax rates or making significant changes to what we spend our state dollars on.